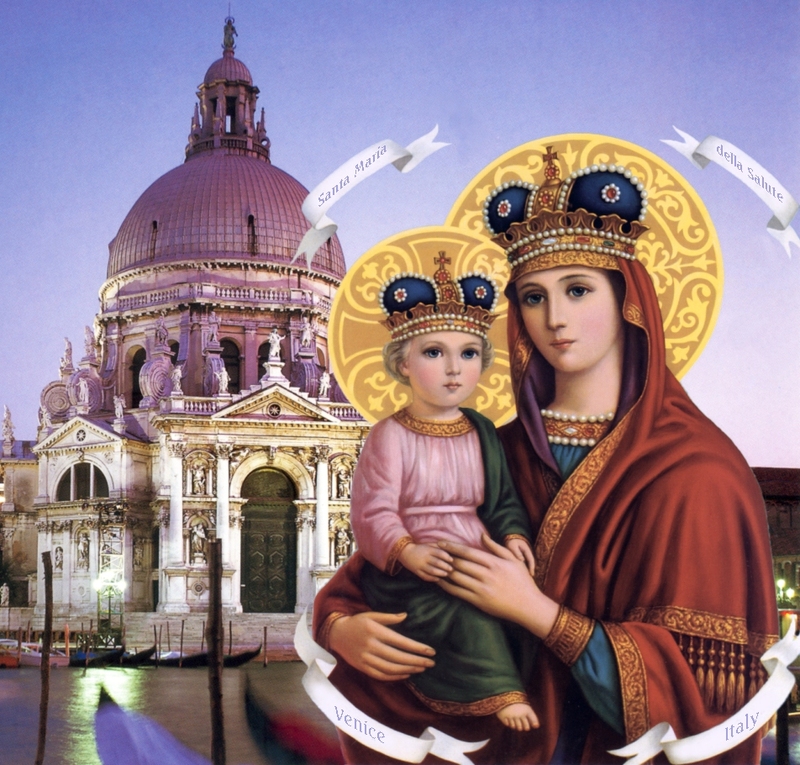 The above image is a composite of a traditional rendition of the Madonna della Salute or the Madonna of Health and the Basilica in Venice, Santa Maria della Salute erected in her honor. Below you will find a link for viewing the image that ours was based on. On November 21 Madonna della Salute holiday is celebrated in Venice to thank The Blessed Trinity and Our Lady for the miraculous end of the terrible plague of 1630, the reason the Basilica was built. Between that year and the following 95,000 Venetians succumbed to the plague. Before the end of the plague, the city's senate decreed that the Basilica would be erected and dedicated to Our Lady if the city was saved; their prayers were answered. The architect, Baldassare Longhena, was only 26 years old when he accepted the commission: he died in 1682, just one year after the church's completion. The Madonna della Salute is built on a platform of more than 100,000 wooden piles. About the same time Francesco Morosini brought a painting of a Madonna dating from 1200 which, by decree of the Senate on November 21, 1670, was set on the high altar. The image was processed from San Marco to the Salute, crossing the Grand Canal on a pontoon bridge laid from Santa Maria del Giglio. From that time on the Madonna was known as the Madonna della Salute (Our Lady of Good Health). Since then the votive visit to the church is held annually on this date; Venetians meet here to bring lit candles in front of the Madonna image. For this purpose a bridge of boats is built to connect the opposite sides of the Grand Canal. An order of Franciscans have in their possession an old icon of the same name, but it does not have a crown. There are shrines of the Madonna in other places throughout the world, for devotees of Our Lady invoke her by name as Our Lady of Health for their intercessions.